Walk-in coolers and walk-in freezers are primarily used to chill or freezer, and safely hold large quantities of both raw and cooked food products. Walk-in coolers and walk-in freezers support daily production activities and preserve an inventory of foods against future customer demand. 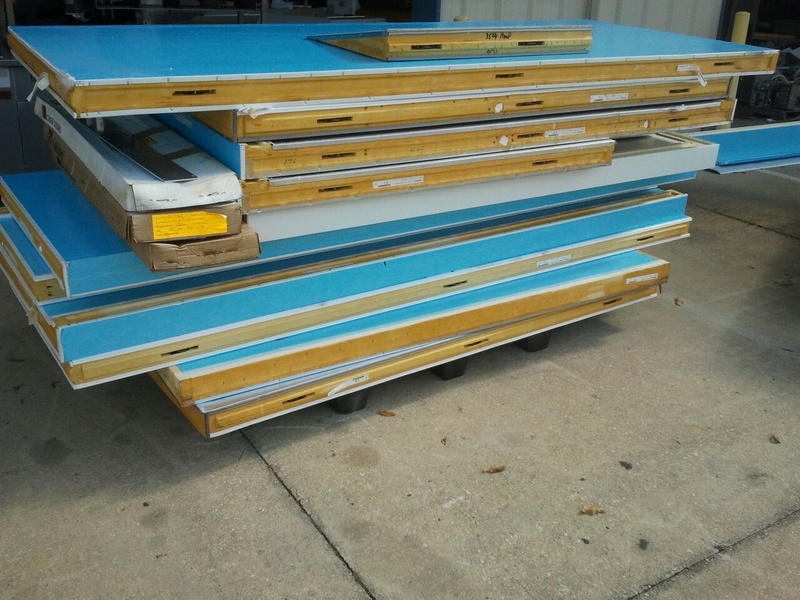 One Fat Frog Restaurant Equipment just got in a load of used walk-in coolers and walk-in freezers and to help make room in the giant One Fat Frog Restaurant Equipment Super Mega Warehouse in Orlando, One Fat Frog Restaurant Equipment is letting them go for super low prices! There are some preventative maintenance tips to keep in mind to ensure that your used walk-in cooler or used walk-in freezer delivers the longest service life possible. Preventative maintenance for walk-ins’ refrigeration systems involves ensuring proper air flow and ventilation in condensers’ areas and routine cleaning of condenser coils by a certified technician. Holding foods in a safely chilled or frozen state to avoid cross-contamination and keeping products at consistent, safe temperatures are a walk-in’s primary food safety function. A walk-in’s temperature monitoring and recording systems can help operators comply with HACCP guidelines, and can be especially useful in cook-chill storage of pre-made foods. All of One Fat Frog Restaurant Equipment’s used commercial restaurant equipment gets cleaned, refurbished, and tested by the staff of in-house, specialized technicians. Each used walk-in cooler and used-walk-in freezer comes with a 30-day parts and labor warranty. One Fat Frog Restaurant Equipment offers free delivery to more parts of Florida than any other used commercial restaurant equipment dealer in the state. One Fat Frog Restaurant Equipment delivers absolutely free to Orlando, Tampa, Jacksonville, Gainesville, Ocala, St. Augustine, Ft. Myers, lake City, Lakeland, etc. Restaurant owners drive from all over Florida to check out the massive selection of used commercial restaurant equipment at One Fat Frog Restaurant Equipment. One Fat Frog Restaurant Equipment is definitely worth the drive! Come check out the One Fat Frog Restaurant Equipment selection of used walk-in coolers and walk-in freezers today!